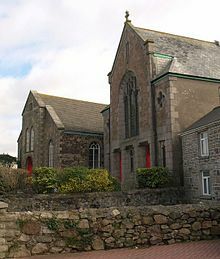 Inspired by the preaching of John Wesley in the area, the first small meeting house at Illogan Highway was built by local tin miners in 1843. As the numbers attending worship increased, a second building was erected in 1888 and when this also became too small the main chapel building was completed in 1903. The composer Thomas Merritt was the chapel organist for several years and his Christmas carols are still sung in the area each year. Zntargvp, va n fcvpl cynpr!